Th-INK-ing of You: Wisteria Blessings and a Super Sunday Sale! Today I'm going to show you a card I made when I first got this set from Our Daily Bread Designs. I had also just gotten my new favorite BasicGrey paper pack, Wisteria. When I was flipping through the pages, this gorgeous page jumped out at me and I could just see the wisteria hanging over the stone wall to this old stone structure. I stamped the image on Aquarello Watercolor Paper with Sahara Sand and did a light color wash on it. Then I overstamped the sentiment with VersaMark and embossed with Gold embossing powder. I cut a few extra "stones" out of a second stamping to create a little wall. Then using my Fiskars finger blade I cut out the bottoms of the wisteria that would drape over the image and slipped the image up under the dp. I mounted the dp on a mat of gold and then a base of Mellow Moss. I then decided to use some Flower Soft (also available at the ODBD store) and to get the wisteria color I had to mix some of the light blue and light lavender. The vanilla worked out perfectly for the white wisteria. I also tried my hand at making a few "cut" flowers but dipping the flower soft wire in the glue and then in the mixture. I did two coats of that and tied them into my bow. The leaves are a Sizzix die cut and a Martha Stewart punch. This card will definitely have to be mailed in a box! I hope you are having a blessed week! I'm picking my Grandkids up tomorrow and they'll be here for several days. What fun! I probably won't get much stamping done while they are here but I do have a few things ready to show you! Thanks so much for stopping by! Before I go I want to tell you about Super Sunday Sale at Our Daily Bread Designs! Every Sunday ODBD will offer a different item at a sale price at Our Daily Bread designs that will be effective for a whole week! Check back often to see what new item is up for special pricing. For this week's Super Sunday Special it's a Punch-A-Bunch Frenzy! All Martha Stewart, Fiskars and EK Success punches are 25% off! There will be no rainchecks so make sure to get in on this fabulous deal, but hurry! Punch sale will end Sunday, June 21 at 12:00 AM EST. Be sure to be on the look out for the next Super Sunday Special announcement! 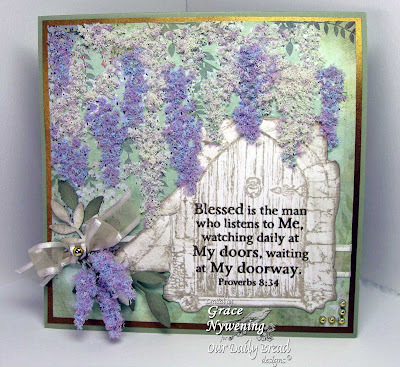 Hello Grace, this card is just gorgeous 0 I love the wisteria - it is so lifelike - your ODB cards are amazing and your details are always so perfect!! Love this Grace - you are inspiring!! I have a little something for you over at my BLOG! WOW Grace...this just blows me away!! What a gorgeous card!!! How clever and absolutely stunning Grace!! Wow!! I love your flower soft Wisteria!! OMGoodness, Grace!!! This is HEAVENLY!! All that work was well worth it!!! So very beautiful and so much work! You have created a gorgeous masterpiece here, Grace! This card is absolutely gorgeous Grace!!!!! I just love how you used the flowersoft to bring your DSP alive and frame the door!!! Just Beautiful!!! Grace this is just gorgeous! I stink at using Flower Soft and you sure have it mastered! Wow! !All I can say is WOW! I love that BG paper too. You have truly been inpired with this one. And what a perfect verse you have chosen! I haven't seen too many people use the flocking in an appealing way, but you have really pulled it off! I can almost smell the blossoms! God Bless your time with the grandkids! What a masterpiece you've made, it is soothing and beautiful and so fitting for this verse, Grace! WOW Grace this is STUNNING!!! WOW WOW WOW! Wow Grace. You have definitely outdone yourself with this card. The detail is phenominal. Love the flower soft accents. This is actually worthy of being framed! Beeeautiful! Hi again Grace! I enjoyed your comments. Thank you for your encouragement. It's funny you mentioned the date, because I've been waiting all day to post a couple new cards, which you can check out now! I really enjoy making cards and would love to be part of a DT, but so far, no luck. Any hints? thank you for your support. Have a blessed evening. Very beautiful, your flowers look awesome. Great card. What beautiful Grace,l love the image and colours. Hey, Grace, can you make me 10 of these? LOL!! Wow, lots os time but so,so gorgeous! Oh, wow, that flower soft accenting is simply AMAZING! What a gorgeous card!